I have personally been promoting the use of alternative energy for more than 30 years, from the time when I was acting as an energy adviser to the Official Opposition in the Province of Alberta, Canada. Alberta is rich in hydro-carbons including conventional and heavy oil, natural gas and tar sands. But it is also rich in wind and solar energy resources. I was arguing at that time that it made sense to use royalty revenues from hydro-carbons to fund the development of an alternative energy industry. It took a while but eventually Alberta got on the alternative energy bandwagon which resulted in the deployment of the first wind turbines in Canada in 1993. The wind industry increased capacity at a steady rate and Alberta retained its position as the Province with the most wind capacity until about 2005. By that time there was about 500 MW of wind nameplate capacity and the Provincial grid operator, AESO, placed a moratorium on further wind development until the impact on the stability and reliability of the electricity generation and distribution system could be assessed. The moratorium was lifted in 2007 despite ongoing concerns on the part of AESO – concerns which have resulted in a series of studies into the best way to integrate more wind generation. Development of wind resources resumed and by the end of 2012 Alberta had just under 1.1 GW of nameplate wind capacity installed. Over the period from 2008 to 2012 electricity peak demand in Alberta grew from 9.8 GW to 10.6 GW, an increase of about 0.8 GW or just over 9%. To preserve a healthy reserve a number of additional generating facilities were brought on-line with the largest increases in the categories of Cogen (which in Alberta are Natural Gas fired facilities supporting Oil & Gas operations), "Peakers" (natural gas-fired single cycle plants) and wind. Total generation nameplate additions during this period were about 2 GW which should have provided more than enough electricity to meet the increased demand. However, imports of electricity from the neighbouring province of British Columbia increased quite dramatically rising from 2.2 GW-Hours to 3.6 GW-Hours. This amounts to an average import capacity increase of approximately 160 MW which is, somewhat ironically, almost identical to the increase in net wind capacity developed over the same time period. This does not seem to make sense. Alberta has a surplus of generating capacity, even without considering wind at all, yet imports have increased significantly. Have we observed such an odd combination of facts before with regard to the electricity generation and distribution industry? In fact, we have. As I have outlined in my previous blog postings about California and Europe the introduction of significant amounts of wind generation capacity results in an electrodox – an electricity paradox where an over-supply of generation capacity that includes wind results in increased net electricity imports. The problem with wind generation is that it varies dramatically over short periods of time. 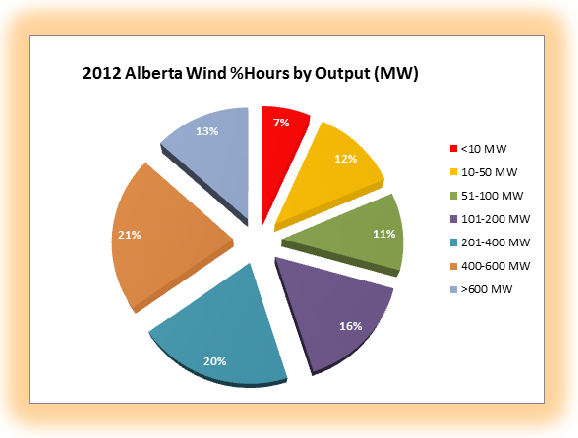 The graphs below show the variability of wind generation in Alberta for the whole of 2012 as well as the percentage of generation hours by MW (data taken from the AESO site). These graphs are enough to make any transmission regulator have a lot of sleepless nights. The speed at which the wind generation ramps up and down is too fast for a response from a thermal generation plant. Base-load coal or natural gas-fired plants can take as much as an hour to change their output in a significant way. Even "peaker" plants take up to 15-20 minutes. 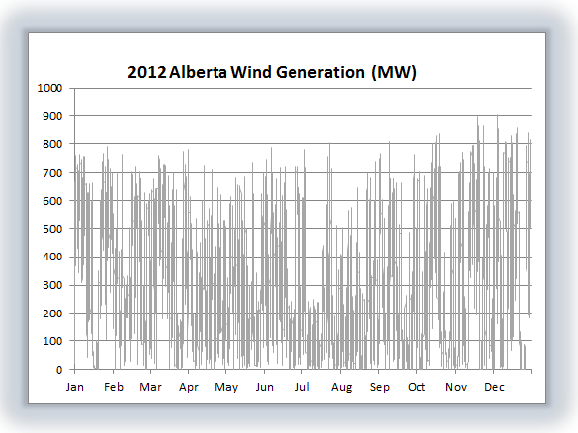 The only large scale electricity generation sources that can follow the wind variability trends are hydro and nuclear. And hydro is exactly what British Columbia has an abundance of. In order to deal with the variability of wind Alberta is forced to import electricity from British Columbia even though there is plenty of reserve capacity within the Alberta system. From the perspective of actually trying to run a generation system primarily using wind the pie chart is particularly worrisome. For 7% of the time there was essentially no wind generation at all (less than 1% of nameplate capacity). That implies that for more than an hour a day, happening at some random time, there will be no wind available which means that another reliable source will have to be on standby to be dispatched on very short notice. In fact, for about 30% of the time – 8 hours per day – wind generation is less than 10% of nameplate capacity. AESO (the Alberta Electricity System Operator) recently completed a pilot project in which they attempted to "dispatch" wind in the sense that various wind farm operators would offer specified amounts of wind energy to the grid operator based upon real-time wind forecasts. If successful, that would allow wind generators to compete with other generators in the Merit Order market. Although there were some positive aspects of this approach, it was found that forecasts even within 20 minutes of delivery had wind producers failing to deliver energy within the Allowable Dispatch Variance about 8% of the time. In other words, forecasting wind is really difficult. And 20 minutes is not a lot of time to give the system operator to line up alternative generation sources. Realistically, all things considered, the bottom line is that Alberta really can't rely upon wind as a generation source. That implies that a complete duplicate generation system must in place in order to step up electricity production when the wind fades or reduce electricity production when the wind ramps up. Some will argue that Alberta is not a good model because of the geographic concentration of wind generation in the SW corner of the province. That is true. But in other parts of the world the very best wind generation sources typically occur in clusters. So the same problems that Alberta faces will be encountered elsewhere. So is this a hopeless case? Not at all. Energy storage solutions will allow time-shifting of wind generation to match demand. Unfortunately, there are no reasonably priced energy storage solutions available today. The recent Phoenix-like emergence of Beacon Power is a positive sign for the industry. The Beacon system of high tech flywheels installed at Stephentown, New York can provide 20 MW of electricity on demand almost instantaneously – but only for about 15 minutes. The system cost $43 million making the storage cost about $43/(20 MW *.25 hours) = $8 million/MW-hour. That's even worse than the battery based system installed recently by Duke energy in Texas which cost about $5 million/MW-hour. Discussions about costs/MW-hour can be confusing so let me clarify what I mean by the numbers quoted above. The largest wind farm built in Alberta to date is the Halkirk Wind Project which cost $357 million and has a nameplate capacity of 83 x 1.8 = 150 MW. On a windy night this facility could easily generate at 70% of capacity for 6 hours or more even though the demand for electricity would probably be very low and prices could be close to zero. If this energy could be stored it could be sold the next day during peak demand time for a much better return. The storage required to accomplish that time-shifting would be 0.7 * 150 MW * 6 hours = 630 MW-Hours. Using a battery storage system such as that installed by Duke the cost would be more than $3 billion. A system from Beacon Power would be $5 billion. Clearly these kinds of costs could never be recovered by reselling the stored electricity in any reasonable electricity market. So new and much cheaper storage technology is key. But just as important as technology improvements are required changes to the practices of grid operators. In Alberta AESO is still trying to determine the appropriate tariff to charge energy storage operators for use of the transmission grid (see section 5.1.6 in the Energy Storage Initiative Issue Identification). The very existence of such as discussion demonstrates a significant problem with the way energy storage systems are viewed. Energy storage is critical to the health of the transmission grid and to the ability to transition to a sustainable energy environment. Energy storage system operators should be paid by the grid for their services – not the other way around! Beacon Power has risen from the ashes principally due a Federal Energy Commission ruling that provides for a premium price for the speed at which electricity can be delivered. That provision plays to the strengths of energy storage systems and is definitely a move in the right direction. A coordinated North American (or global) policy that supports the development of energy storage systems in the same way would provide welcome support for the developers of this technology. In summary, the Alberta situation demonstrates all of the characteristics that will be common to wind energy development anywhere in the world. Wind is a highly variable source of electricity generation which will require stabilization through access to energy storage – either through imports of fast-response generation from other jurisdictions or through the development of new technology. Energy transmission policy needs to evolve to become supportive of energy storage solutions. Until these problems are overcome Alberta will continue to rely upon traditional thermal generation and the further expansion of wind farms will be largely depend upon renewable energy support mechanisms of one sort or another. In a recent blog I discussed the possible use of modernized water wheels to generate electricity. I received some feedback questioning the technical feasibility of this idea which led me to do some further research into the hydro-electric power potential remaining in North America. I was a bit surprised to learn that there is considerable potential to use existing dams, built primarily for flood control or navigation purposes, for the generation of electricity. 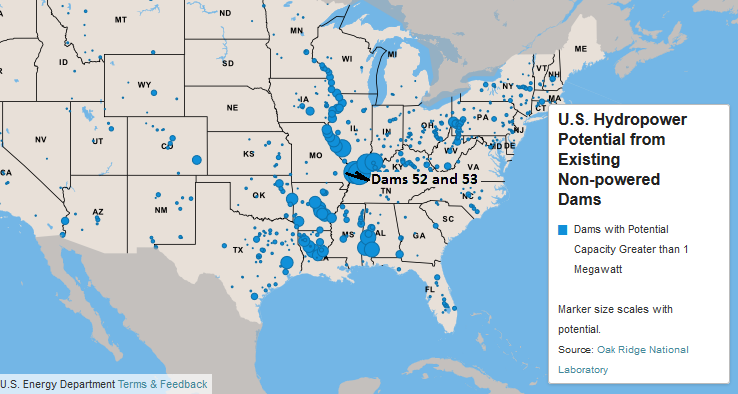 A recent government report identified almost 12 GW of potential from these dams. Even more interesting is the concentration of this potential with some 3 GW of capacity available from the top 10 sites. The largest of the potential dam conversion sites, known simply as dams 52 and 53 on the Ohio River, has a combined potential of more than 500 MW. By way of comparison, this site alone would generate more reliable electricity than the largest wind farm in the United States. But knowing that a site has potential is one thing. Obtaining the funding, environmental approval, and putting together required partnerships represents a far greater challenge. 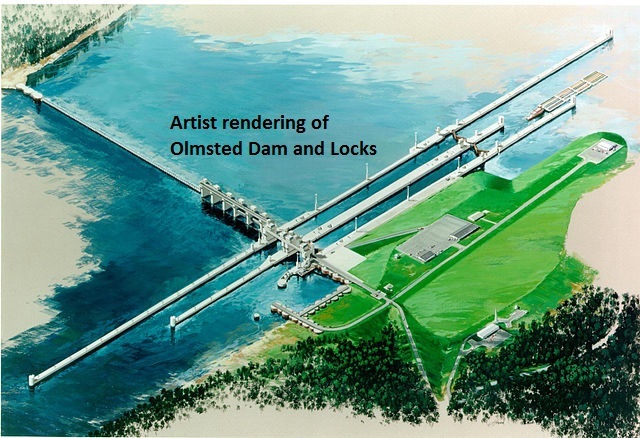 For example, dams 52 and 53 are being replaced by a new set of locks and a new dam through the Olmsted project being managed by the U.S. Army Corps of Engineers (USACE). This project has been mired in controversy and cost over-runs ever since the original funding in the amount of $775 million was approved in 1988. Twenty-five years later the cost estimate is just under $3 billion and the project still has several years of construction ahead of it before it will be completed. Worst of all, it appears that no electricity generation is being incorporated into the design. The lack of electrical generation capacity could be the result of a restricted mandate for the USACE, which has the responsibility to provide flood control and to maintain a navigable inland waterway. The development of hydro-electric facilities does not fit this mandate. Electrical generation and distribution in Kentucky is through a regulated monopoly, the Kentucky Utilities Company (KU). Therefore the addition of hydro generation to the Olmsted project would require a partnership between KU and the USACE making an already complex project even more difficult. In summary, although a number of very attractive dam conversion projects have been identified it will take substantial political support and expedited approvals to bring any significant production on-line in the next ten years. Apart from the potential dam conversion projects there is also a considerable amount of untapped energy in the force of moving river water. This is termed hydro-kinetic energy and it is that energy that I was attempting to tap into with my proposal for a modernized water wheel. A study by the Electric Power Research Institute estimated the Hydro-kinetic potential of the continental United States at approximately 120 TW-Hours which translates into about 13 GW of capacity. The feasibility of realizing this potential depends not only upon overcoming the same environmental, political, and organizational issues faced by dam conversion projects but also upon the development of cost-effective and efficient hydro-kinetic technology. Free Flow Power holds the largest number of preliminary permits for Hydro-Kinetic power installations in the U.S. 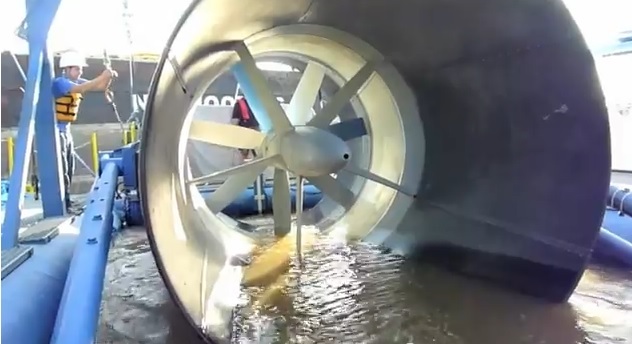 The company has installed a 40 KW turbine in the Mississippi River for two extended test runs during which the performance exceeded expectations. More than 3 dozen sites are now being considered for utility-scale deployments. A different approach, using a device very much like the one I described in my previous blog, is being installed in Europe by Zurich-based ClearStreams-Linello AG. So far they claim 8 installations and a modular design that will allow them to deploy water wheels in many different configurations. Rivers have always played a critical role in the development of human civilization. They were the super-highways of the ancient world. They have supplied us with clean drinking water and we have used them to irrigate our crops. They have nourished us both physically and spiritually. And, since the development of the earliest water wheels thousands of years ago, rivers have provided us with power. It is interesting to think that new technologies developed in the 21st century could harness the untapped kinetic energy of rivers to help us transition to a sustainable energy environment. In my last blog I discussed the electricity paradox – electrodox is the term I used – that is disrupting the European electrical generating utilities as increasing amounts of renewable generation sources are developed. Perhaps the most dramatic summary of the impact of the European electrodox was the statement by Moody's in November, 2012 that "Wind and solar power will continue to erode thermal generators' credit quality". The electrodox is a combination of higher nameplate capacity (increasing electricity supply) combined with flat or dropping demand. In any normal commodity situation this should produce a drop in prices. However, in an electrodox the retail price of electricity increases. The excess supply of generating capacity should also enhance energy independence. In an electrodox firm reserve capacity actually declines and imports increase. Having looked at some of the European data I decided to see if the situation was similar in North America. I investigated one of the larger electricity markets on the continent – California – and I found that in the the Golden State the Electrodox is alive and well. The chart below displays information about the electricity generation capacity and consumption within California over the period 2002 to 2011 – the time when significant amounts of renewable electricity generation was introduced into the California market. (The Electricity Generation Capacities and Total System Power including imports are from the California Energy Commission Almanac). Between 2002 and 2006 a relatively healthy economy resulted in increasing electricity consumption. Nameplate capacity and California generation grew at about the same rate and imports remained roughly constant at about 63 GW-Hours. Starting in 2007 the electricity production in California began a slow decline despite the fact that nameplate capacity continued to increase. 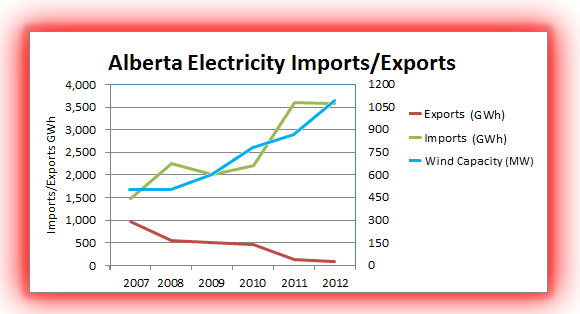 Imports rose dramatically as the drought that began in 2007 cut hydro generation by more than 22 GW-Hours. 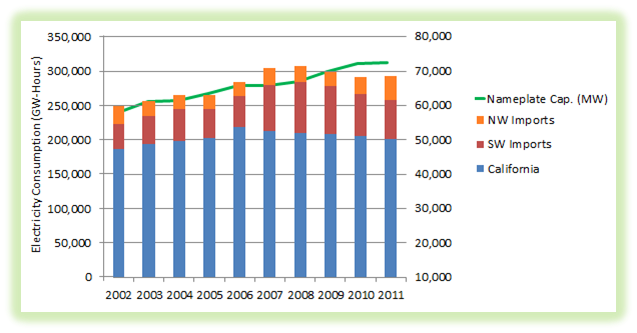 After 2008 overall electricity consumption (as indicated by the top of stacked bars) began to decline. This was primarily due to the financial crisis combined with continued conservation and energy efficiency measures as well as the installation of residential and commercial PV Solar. From 2008 to 2011 nameplate capacity continued to increase due in part to the development of more wind and solar supported by subsidies and mandated Renewable Portfolio Standards (RPS) requirements. Despite this increase in capacity and a recovery of hydro production back to historic levels, overall California generation continued it's slow decline and imports of electricity into the state did not decrease. So what are we to make of this seemingly contradictory information? My interpretation is that the variability of renewable energy, in particular wind, has resulted in both reduced utilization of California generating assets and an ongoing requirement for imported electricity. 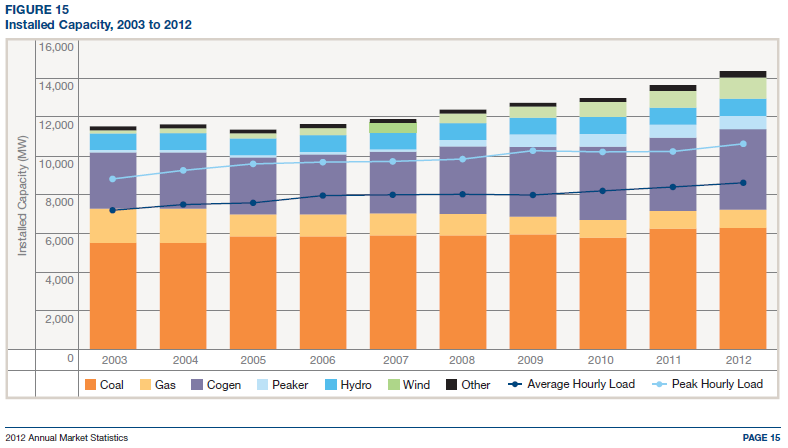 By 2008 wind generation capacity in California had reached about 2 GW and by 2011 that had doubled to just under 4 GW. Because of the variability of wind this source can produce between 0 and 100% of nameplate capacity and that figure can change dramatically in a matter of minutes. In California, as in most jurisdictions, wind generated electricity is given preferential access to the grid and will bump other generators, primarily coal-fired and gas-fired plants off the grid when the wind is blowing. Given that the average demand in California is less than 25 GW the amount of wind generation capacity has become significant, rising from about 10% of average demand in 2008 to almost 20% in 2011. Sudden drops in wind generation need very rapid responses. Without having access to hourly generation data and import electricity flows it is impossible to state definitively that wind variability is the cause for continued imports of electricity into California. But the most likely scenario seems to be that changes in wind generation are balanced by very rapidly responding external sources such as hydro from Oregon and Washington and nuclear from Arizona. This is exactly the pattern that has been identified by analyzing development of wind electricity generation in Denmark. The bottom line appears to be that increasing the development of renewable generation in California has not increased the amount of firm/dispatchable generation or decreased the need for electricity imports despite reduced overall consumption. What about electricity prices? An electrodox results in higher prices despite increases in nameplate capacity and weak demand. As expected, this is exactly what has happened in California, as shown by the graph below. 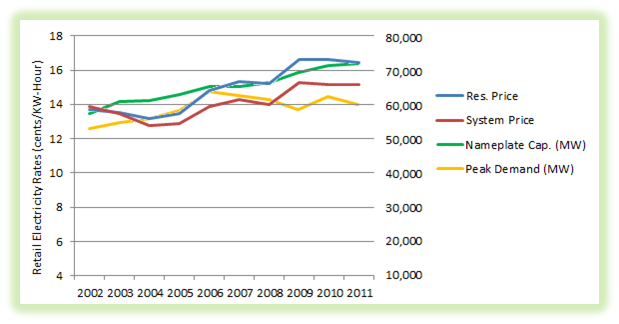 System-wide rates have gone from about 13.5 cents to 15.1 cents/kw-hour between 2002 and 2011, a rise of about 12%. Residential rate-payers have been hit even harder with their rates going from about 13.5 cents to 16.5 cents/kw-hour during the same time period, an increase of over 19%. This despite the fact that nameplate capacity has increased much more quickly than peak demand. These price increases make total sense as the new renewable generation has to be paid for while the existing, reliable thermal generating assets also have to be maintained in order to backstop the renewables. In summary, all of the characteristics of an electrodox as I have defined it exist in California just as they do in several countries in Europe. The situation will only get worse as more and more non-dispatchable renewables are developed. The real stress-test for the new environment will take place when coal-fired plants in the U.S. start getting decommissioned to meet MACT requiremements. In Europe there are plans to decommission a number of coal-fired and gas-fired plants because they can no longer be run profitably. For a comprehensive analysis of the European situation check out Paul-Frederik Bach's blog. Scroll down to the February 21, 2013 entry entitled "ENTSO-E Views on Capacity Mecanisms".